Many areas in Hollywood are prone to flooding from heavy rain. Some floods develop slowly, while others such a flash floods can develop in just a few minutes. Be aware of flood hazards no matter where you live or work, but especially if you are in low-lying areas or near water. The safest place for you during a flood is your home. Unplug all electrical appliances, computers, TVs, etc. 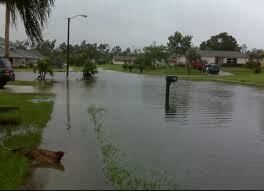 Do not go outside or wade in standing flood water, which can contain contaminants such as sewage and chemicals. Do not let children or pets play in flood water. Following a heavy storm, sharp debris could be hidden in the water and cause injury. Standing water also may contain harmful bacteria that could cause infection. If downed power lines are hidden under standing water, there is the risk of electrocution. If water begins entering your home, place towels at the bottom of all your exterior doors. This might not stop the water but should slow it down. Once water has already flooded the area outside your home, the use of sandbags will not help contain the flooding. If you are stranded in your home, remain there and try to call a neighbor or friend every hour to advise them of your status. Use either a battery-powered TV or portable radio to listen to any news updates. Unless notified otherwise by the City of Hollywood, all City public utilities functions should be fully operational and working properly. If the status of this changes, residents will be notified via a reverse 911 phone call and through the news media. Information will be posted on the City’s Government Access Channel (Channel 78). Avoid driving on flooded streets. It is often difficult to determine the depth of murky water until it is too late. Unnecessary travel during flooding conditions is not advisable. If you are stranded in your vehicle during a flood, try to remain there until the flood water subsides. You also may attempt to walk out of the area if you can determine it is safe to do so. If you are injured, use a cell phone to call 911 or try to flag down help from someone nearby. Police and fire rescue personnel will respond to all emergency situations. Call 911 if flood damage to your home has created an emergency situation such as a fire. If an emergency situation does not exist, you may call the City of Hollywood Emergency Operations Center at 954.967.4362. Additionally, you should notify your homeowner’s insurance provider and seek their advice on documenting the damage and drying out your home. In the case of a medical emergency, call 911. For more information on how to protect yourself and property from flood hazards, please visit the Florida Division of Emergency Management at www.floridadisaster.org.